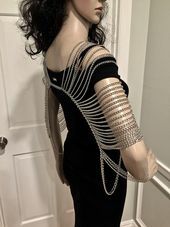 I designed and handmade this beautiful and fashionable slave bracelet. It can be worn for any occasion or event. It will capture everybody's attention. I know this because I experienced it with a similar piece. The bracelet charms are enforced with a silver color wire. In the center of each charm is a little shiny crystal. The bracelet closes with a hook, which makes it easier to put it on and take it off.